Chris Kennedy hails from Australia and has been diving for over thirty years. He became a regular visitor to Aqaba when working here in the Middle East. His passion is underwater photography in Aqaba he found that he could indulge in this passion without crowds of divers in other parts of the Red Sea. A couple of years ago another of our visitor Nick Tessier who completed his Master Scuba Diver with us and then went on to Tec Diving through to Tec Trimix Diver had also completed a PADI Dolphin Semi Closed Rebreather course with me. He suggested to Chris that this would be great for his photography. On his next visit Chris completed the Dolphin course with me and purchased a unit…..several months later, Chris, being an engineer, has converted his Dolphin to a mCCR. After which he decided to build an mCCR from scratch. The prototype was tested in Aqaba and Saudi Arabia for a 12 month period and refinements were made after which a second unit was built. 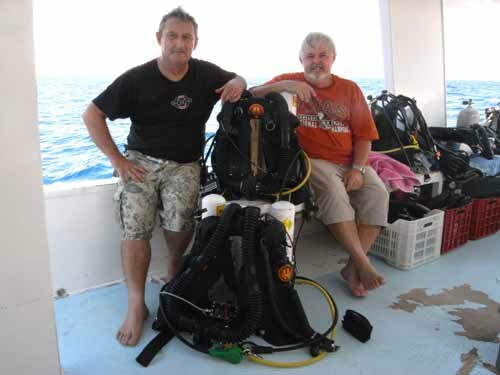 Pictured here is Rod Abbotson with Chris Kennedy with the two units on our dive boat Laila One and decompressing after a technical photography dive to the wreck of the Taiyong in Aqaba. Currently a training manual and operating manual for these units are being written and third party testing of the unit being arranged. (Please note that Chris had completed proper training through another agency on another mCCR with Rod prior to building this unit and using it). In recreational or technical diving a CCR is great for catching those perfect images underwater. 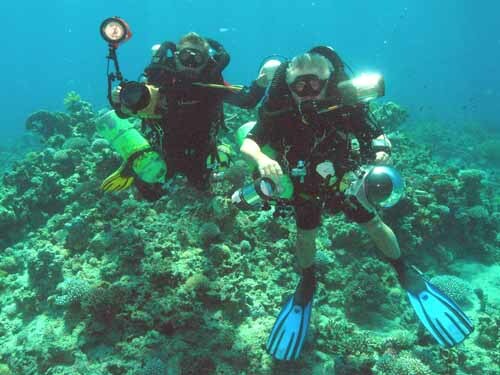 PADI will be launching courses in both areas over the next 12 months. So when can we look forward to seeing a PADI course on the GAF , you can put me down for the first one ! I miss diving with the Pelagian , this DCCCR is the best in the Market !!! !